Adam Sharp is a middle-aged contract database architect, living in England. One day he receives an email from a former girlfriend. The first part tells the story of Adam and Angelina. They met while he was working on a three month contract in Austrailia. She was a married actress and they had a short affair. Twenty years later, when she is on her second marriage, she contacts Adam. Adam has to decide if he will follow his heart by returning to Angelina, or stay in England with his partner, Claire. Music plays an important part in the novel because Adam and Angelina meet while Adam is playing piano in a bar. At the end of the story, there is a list of all the songs referenced, as well as a link to a Spotify playlist. This was a nice touch that brings the reader into the story. This story tugs at the heartstrings with the moving story of Adam’s lost love. There were also major plot twists that I didn’t see coming. This novel is a great follow up to Graeme Simsion’s bestsellers The Rosie Project and The Rosie Effect. My favourite nonfiction subject is publishing. I love reading about the history of books and how they are printed. 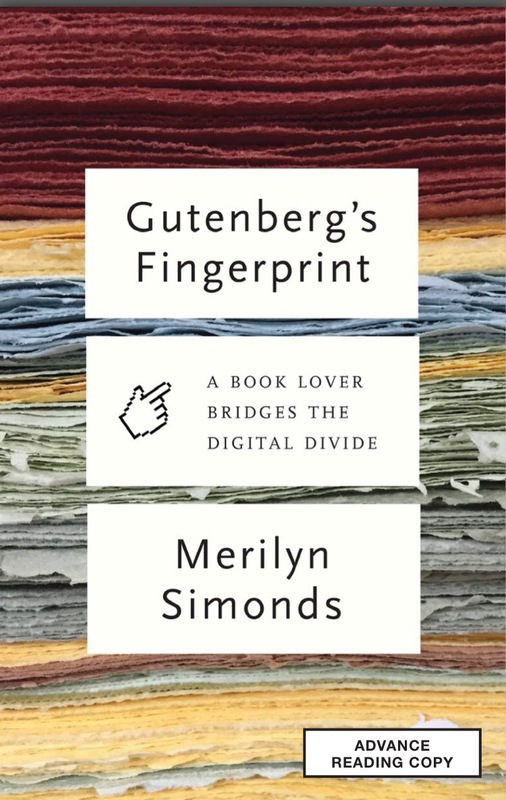 I was so excited to have the opportunity to get an ARC of Gutenberg’s Fingerprint from ECW Press. Merilyn Simonds writes about the process of publishing her book The Paradise Project, a collection of flash-fiction stories. She chose to have this book printed by Thee Hellbox Press, a small press in Kingston run by Hugh Barclay. Hugh is very particular about his printing, so he took good care of Merilyn’s book. He involved her in the whole process, from setting the type, mixing the ink, and printing the proofs. The endpapers were even created using the flowers from her garden! Throughout her story of the creation of her book, Merilyn gives some history on how ink and paper are made. These stories made me smile, reminding me of my book history course in university. The irony that I was reading a book about the history of printing on an ereader was not lost on me. Merilyn created a digital edition of The Paradise Project with her son, Erik. She discusses how ebooks have changed the publishing industry, but print books aren’t going anywhere soon. Printing has evolved from scribes writing on vellum to machines stamping ink on paper to pixels appearing on a screen. Technology is still evolving the way books are delivered to the reader, but it couldn’t be done without Gutenberg’s press. Here are my new books this week! 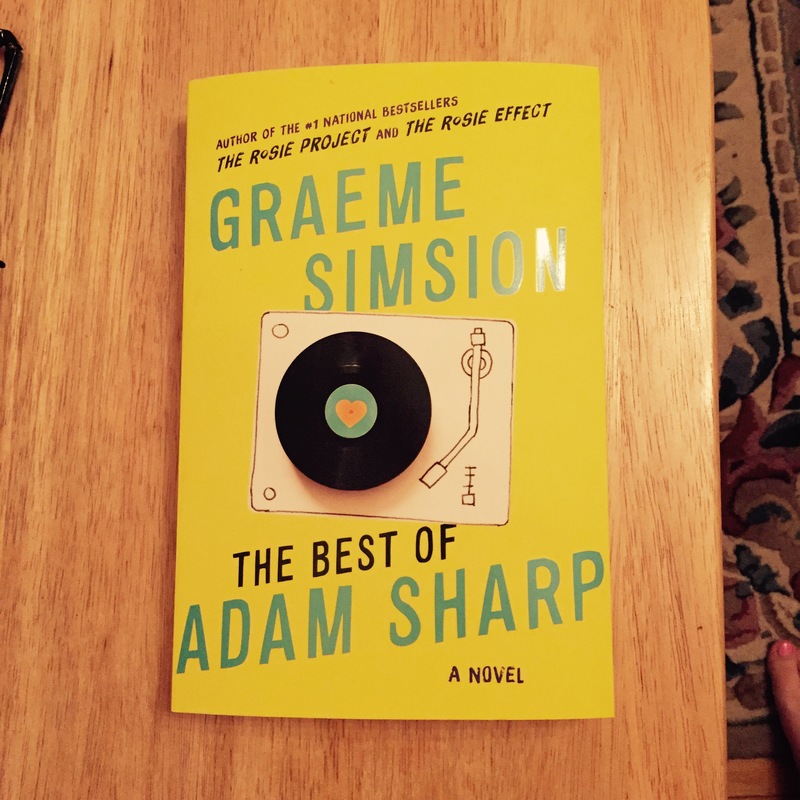 The Best of Adam Sharp is the latest book by Graeme Simsion, the author of The Rosie Project and The Rosie Effect. Both of those books were great, so I’m looking forward to his new one! There has been a lot of buzz on social media about The Finishing School by Joanna Goodman. I’m very excited to start it. 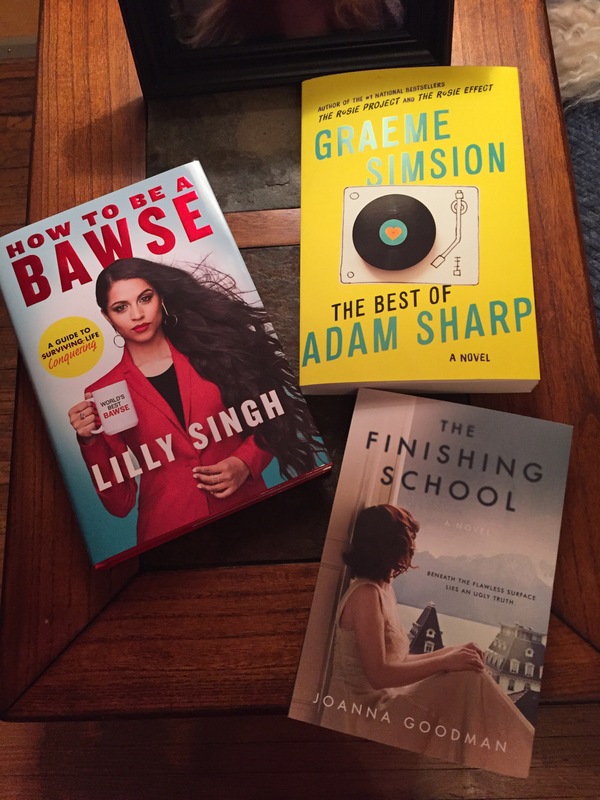 How To Be a Bawse is the debut book from the YouTube star Lilly Singh. She’s very talented so I’m sure her book will be a hit. 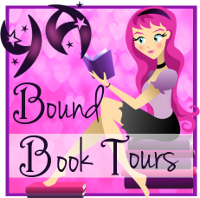 Look for my reviews of these books this week! Stewart and his dad move in with his new girlfriend and her daughter Ashley. Stewart’s mom died a year ago, and Ashley’s parents got divorced because her dad came out as gay. Stewart is thirteen and goes to a special school for gifted children. Ashley is fourteen and goes to the local high school. But when Stewart moves in to Ashley’s house, he decides he wants to go Ashley’s school, to improve his social skills. Though Ashley is mortified that her new step-brother is going to her school, she soon figures out that she needs him as much as he needs her. This book covers a wide range of problems that teenagers face. Stewart has to deal with the death of his mother. Ashley has to learn to accept her father for who he is, and not be ashamed of him. They both have to face teenage drinking and parties, and the negative consequences that can come from that. I really liked how the book addressed so many important issues but was still able to keep a light, humourous tone. There were both laugh-out-loud and heartbreaking parts. 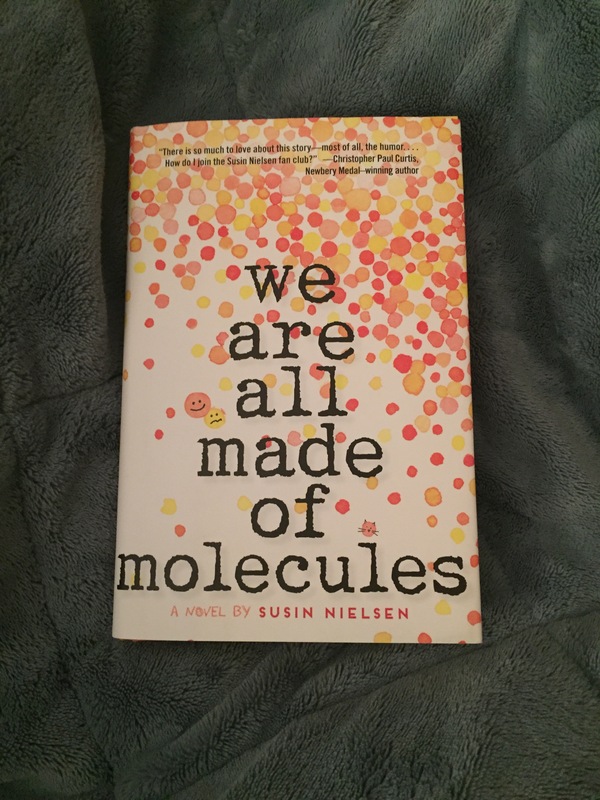 Most importantly, this book shows that we all have something in common, despite our differences: we are all made of molecules. 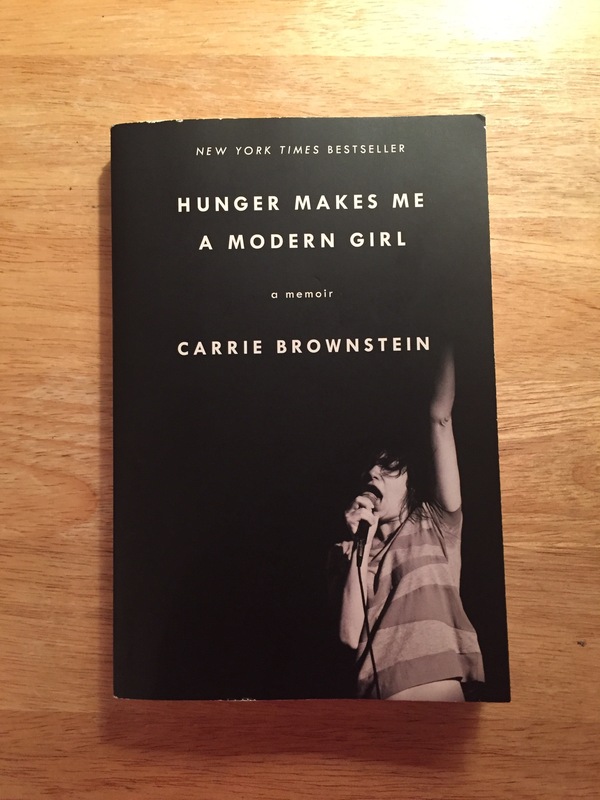 This is a memoir by Carrie Brownstein, a musician, writer, and actress. It follows her time with her band Sleater-Kinney through the 1990s and 2000s. I picked this book up because it was one of the picks for Our Shared Shelf, Emma Watson’s book club. I really liked the first quarter of the book. Carrie talks about her life growing up in Washington state, including her mother’s eating disorder and her parents’ divorce. The details of Brownstein’s band took up half of the book. If you aren’t familiar with it, like me, it will probably be difficult to get through. There were many details about how they wrote their songs, recorded of their albums, and toured the world. Unfortunately a lot of this was lost on me since I don’t know much about the indie music scene in the 1990s. At the end of the book, Brownstein returned to stories from her personal life, after the band had broken up. This part brought me back into the story of her life. She is an excellent writer, which pushed me to keep reading even when I wasn’t interested in the topic. I liked her feminist commentary on how her female band was treated in a male-dominated industry. I can see why it was chosen to be a book for Our Shared Shelf. Josephine aka Jonesy is a high school student. She lives with her father, who owns a donut shop. She also has a pet ferret. The story follows Jonesy through major parts of the school year: Valentine’s Day, a talent show, prom. She also has to face the idea of her father starting to date. Though these are fairly ordinary things that most teens face, Jonesy is unique. She has a special power: she can make people do anything she wants. Jonesy discovered this power when she made her two favourite characters on her anime show fall in love. The only problem is that the powers don’t work on Jonesy herself. 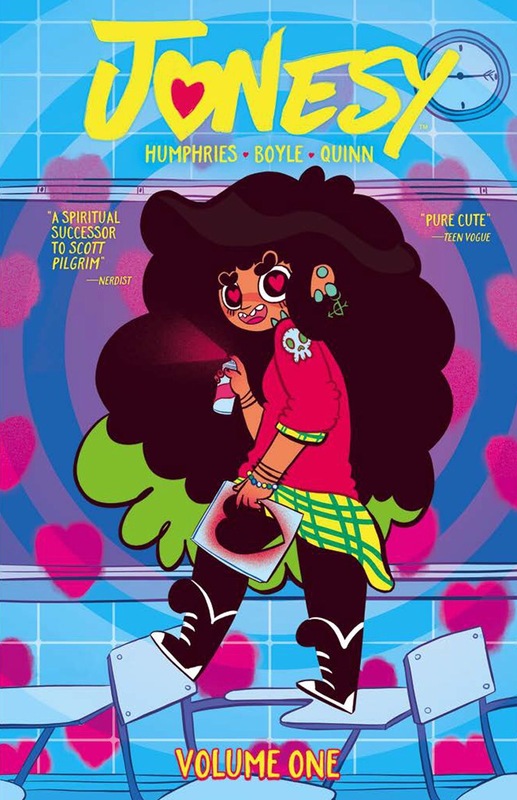 She isn’t able to make her crush (a pop star named “Stuff”) fall in love with her. This graphic novels was so entertaining. It was very funny. There were many times that Jonesy spoke directly to the reader, especially at the beginning of the chapters. This breaking of the “fourth wall” set the scene and brought me into the book. This story also has a diverse cast. Jonesy is latina. Her best friend, Susan, is black and has a crush on a girl. It was refreshing to see these diverse characters in a YA/middle-grade graphic novel. I definitely recommend this graphic novel and I can’t wait to see the next volume! The story opens with Captain Marvel, and others, entering a market. They disperse, and then someone named Tic disappears. Flash back to six weeks ago. Captain Marvel is in New York. Iron Man asks her to go to space to represent the Avengers. In space she meets the Guardians of the Galaxy and they find Tic, who Captain Marvel takes to her home planet. Then she fights for them in a battle to keep them on their planet. If that sounds confusing and disjointed, that’s because it was. This was the first Captain Marvel comic I’ve read and I was disappointed. I thought it would be more of an origin story, like many of the Marvel reboots have been in recent years. 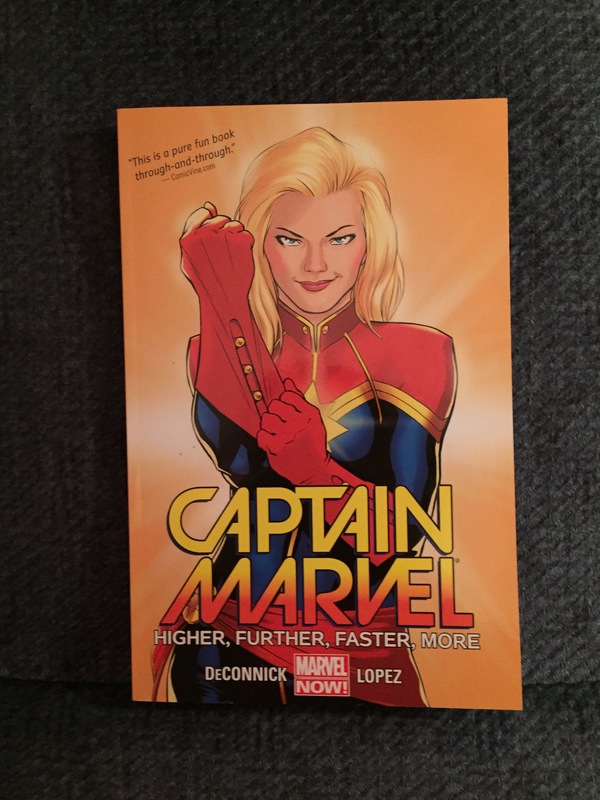 There were many parts in the graphic novel that didn’t even have Captain Marvel in them. I didn’t understand why the story focused on the other planet when she was supposed to be the main character. My favourite part was when she teamed up with the Guardians of the Galaxy because I’m more familiar with them than Captain Marvel. I understood their personalities and purpose. Since this story didn’t provide a background for Captain Marvel, I didn’t feel connected to her in any way. Unfortunately this graphic novel fell flat for me. However, it made me want to pick up a Guardians of the Galaxy comic, so it wasn’t all bad!